Announcement: Venue Change. The meeting will be held at the The Ukrainian Chamber of Commerce and Industry in the COLISEUM Hall (4th floor) located at 33 Velyka Zhytomyrska Street, Kyiv (entrance from the side of Velyka Zhytomyrska Street). The company has reviewed the proposed terms and conditions of cooperation following a number of meetings with the potential partners and consultations with the external industry experts. The project will consist of two stages as before: pre-qualification and bidding among the qualified participants. However, the pre-qualification criteria, the number of field clusters and the project implementation deadlines have changed under the new approach. Project’s teaser and pre-qualification criteria are available at the bottom of this text. In order to be admitted to the bidding process, as part of the pre-qualification procedure, the participants shall send the package of the official documents confirming the compliance of the participant with the pre-qualification criteria by 10am June 1, 2019 to the e-mail address pec@ugv.com.ua. The purpose of the PEC project is to engage an experienced operator to increase production and reduce operating costs at our fields, that still have significant potential, but compared with other assets in our portfolio, have lower priority in terms of resource allocation, through introduction of modern technologies and attraction of own investments. This would allow UGV to direct its own human resources and capital to other important projects»- noted Andrey Favorov, Director of Integrated Gas division. Potential partners and other interested participants are invited to attend the round table meeting where the new project terms and conditions will be presented in detail, and the extensive answers will be given to questions. The meeting will be held at 11am April 24, 2019 at the press center of JSC Ukrgasvydobuvannya located at 26/28 Kudriavska Street, Kyiv, 01034. Accreditation for the event and information provision is possible through submission of the email request at pec@ugv.com.ua by 5pm April 19, 2019. The application request should include the participant’s full name, position and company name, contact phone number. Please note that the non-resident participants are also required to attach a copy of the passport page with the basic information about the visitor. 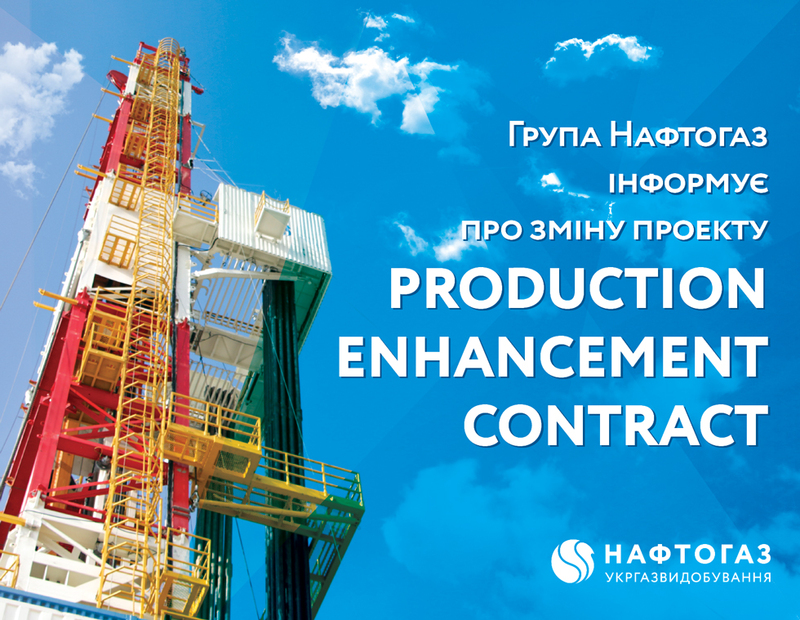 UGV has invited oil & gas companies to cooperate and give their feedback on participation in gas production enhancement project. The Company offered cooperation to those oil & gas companies which have modern technologies in production enhancement through conclusion of production enhancement contract (PEC) on production stimulation in gas field group. Since such type of contract has never been concluded in Ukraine before, UGV is a pioneer, just as in a number of other areas of gas production market development. One or several contracts were expected to be concluded for a period of 10 (15) years with the possibility of prolongation for another 10 years. The existing UGV gas fields were assessed according to the main indicators (current gas production volume, proven reserves, depths, IRR drilling, production/reserves ratio, liquid hydrocarbon reserves, etc.) and categorized by statistical methods into more or less homogeneous clusters, among which the ones most applicable for this particular form of cooperation for both Ukrgasvydobuvannya and the market have been selected. Following the selection results, it is planned to conclude one or several PECs in gas field groups (clusters), with the development of the relevant surface facilities and preservation of Ukrgasvydobuvannya’s absolute ownership of assets, products and licenses. The potential UGV partner or partners is expected to implement a significant investment program and perform hydrocarbon production enhancement operations on the mutually beneficial conditions.